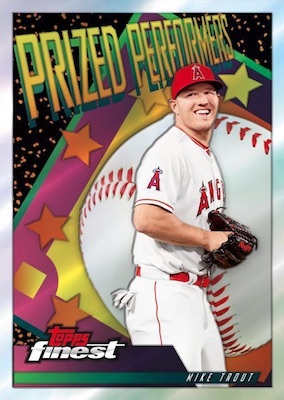 2019 Topps Finest Baseball continues a very long collecting tradition of stylized designs and plenty of Refractor pop. Matching the hit yield from 2018 Finest MLB, the Master Hobby format includes two six-pack mini boxes that each have an autograph, for a total of two signed cards per Master box. Maintaining the brand's legacy, the 2019 Topps Finest Baseball base design utilizes multiple elements. Of course, that includes a wide spectrum of Refractor color. 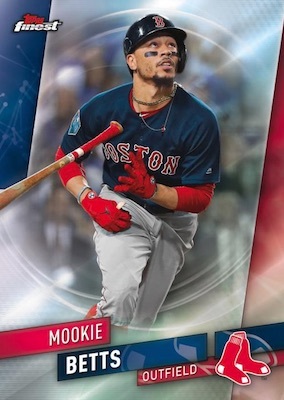 The Extended Base Set is similar to high-series SP cards, but specifically for seasoned players not found in the main set. These have only Gold Refractor (#/50), Red Refractor (#/5) and SuperFractor (1/1) parallels. 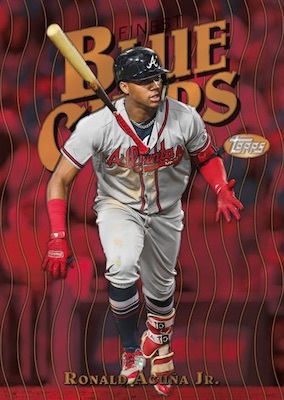 Within 2019 Topps Finest Baseball, collectors can also find some familiar insert lines and some new throwback choices. Finest Firsts continues the rookie approach while the Finest Careers Die-Cut cards, falling two per case, pay tribute to Hall of Fame pitcher Mariano Rivera with a 10-card set. New this year, Finest Blue Chips revisits the 1997 baseball insert using young stars of today. Prized Performers jumps back to the NBA Lottery Prize design from 1994-95 Topps Finest Basketball. This time, however, the focus is on MLB superstars. In addition, every insert has Gold Refractor (#/50), Red Refractor (#/5) and SuperFractor (1/1) parallels. 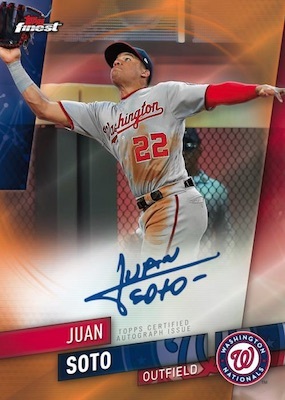 However, the 2019 Topps Finest Baseball checklist really kicks into overdrive with an abundance of on-card autographs. 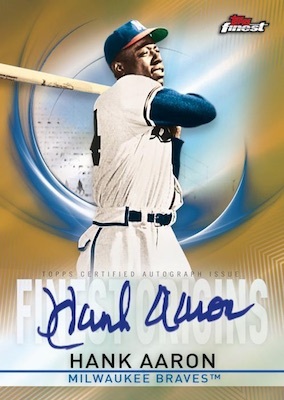 The Finest Autograph and Finest Firsts Autograph cards are among the most common options. The two sets also have the same Refractor rainbow shown below. The case-hit Finest Origins Autograph cards zero in on key moments, adding Gold Refractor (#/50), Orange Refractor (#/25), Red Refractor (#/5) and SuperFractor (1/1) parallels. Bringing on-card signatures to the insert lineup, as well, Finest Blue Chips Autograph and Prized Performers Autograph cards incorporate Orange Refractor (#/25), Red Refractor (#/5) and SuperFractor (1/1) parallels. Numbered to just 10 copies, the Finest Career Die-Cut Autograph cards stick with Mariano Rivera. A little intrigue comes from the Finest Mystery Redemption cards that are good for a to-be-determined, hard-signed autograph. Collectors can also find Finest Originals Autograph buybacks from the 1990s and 2000s. 2018 Topps Finest Gold Refractor ALEX VERDUGO RC On-Card Auto!!! #30 50!! !